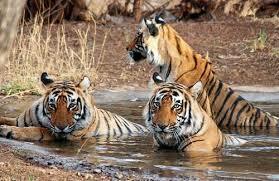 Ranthambore National Park is one of the largest national parks in Northern India, covering entire area of 392 km². It is situated in the Sawai Madhopur district of southeastern Rajasthan, about 110 km northeast of Kota and 160 km southeast of Jaipur. The nearest town and railway station is at Sawai Madhopur, about 11 km away. The park is also close to the Kota railway station. Ranthambore National Park lies at the edge of a plateau and is bounded to the north by the Banas River and to the south by the Chambal River. 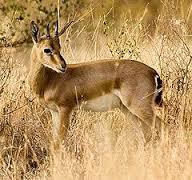 It is named after the historic Ranthambhore fortress, which lies within the park. Ranthambore wildlife sanctuary is known for its tigers and is one of the best places in India to see these animals in their natural jungle habitat. Tigers can be easily spotted even in the daytime. The best times for tiger sightings at Ranthambore National Park are in November and May. The park's deciduous forests are characteristic examples of the type of jungle found in Central India. Other major wild animals include leopard, nilgai, wild boar, sambar, striped hyena, sloth bear, southern plains gray langur, rhesus macaque and chital. The sanctuary is home to a wide variety of trees, plants, birds and reptiles, as well as one of the largest banyan trees in India. I am missing my school friends. Each and every moment I spent in the school is memorable. I still miss every lecture, especially Krishna Gopal Sir's lecture. My favorite teacher is our Ex-Principal ma'am and the other entire teacher who taught us in 12th standard. When I was studying, all the Annual Functions which I attended and participated were special and awesome. 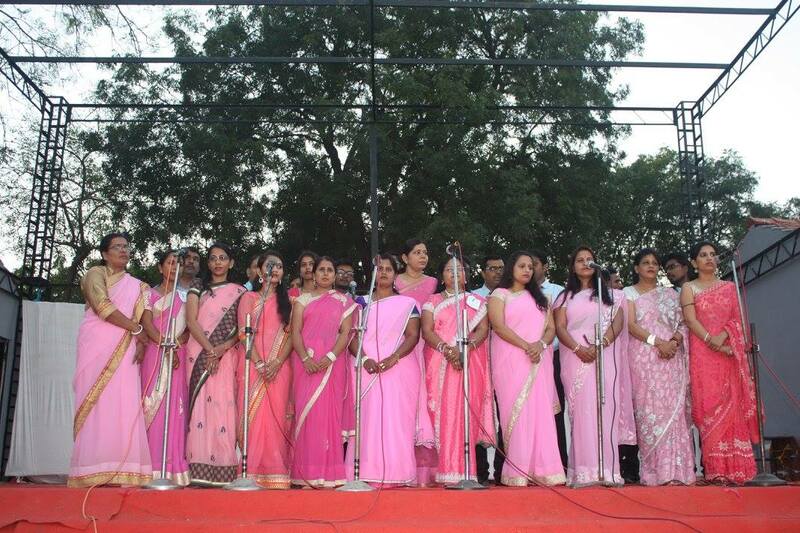 And as much I remember I have not missed any annual function of my school when I was studying. I am missing my classmates when I was in school. In my view point The Fabindia is the best school in this area. I am so lucky that I didn't need to change the school. Friday, 18th November: Seventeen Staff Members were awarded Certificate of Appreciation for their successful completion of Level I of Professional Development Programme delivered at The Fabindia School, Bali. Mr. Ajay Vijaywargi, Mrs Aysha Tak, Mrs. Bharti Rao, Mr. Byju Joseph, Mrs. Kavita Devda,Mr. 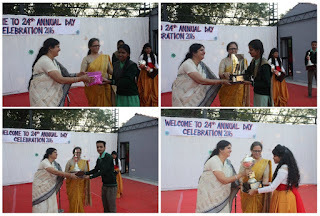 Krishan Gopal, Mrs. Kusum Dangi, Mrs. Kusum Sharma, Mrs. Monika Vaishnav, Mrs. Prerna Rathod, Mrs. Priyanka Mahatma, Mrs. Rajeshwari Rathore, Mrs. Sharmila Vijaywargi, Mr. Surendra Singh, Mr. Suresh Negi, Mrs. Urmila Rathore and Mrs. Usha Panwar received the Cerificate of Appreciation. Monday, 14th November- Sunday, 20th November: Nine MGD Girls escorted with their teacher Ms. Reena Kumar came to School for an Exchange Program. Five Teachers from the School hosted them to give them an experience of different lifestyles, culture and traditions of rural area which was very different from Jaipur. They helped in exhibitions and gave a dance presentation. On 19th November they visited Ranakpur Temple and Jawai Bandh escorted by five teachers. On 2oth November they returned back to Jaipur after visiting Golden Temple at Falna. Their Exchange Program was euphoric..
Thursday, 17th November: Grand rehearsal took place from 11.00 AM to 2:00 PM. 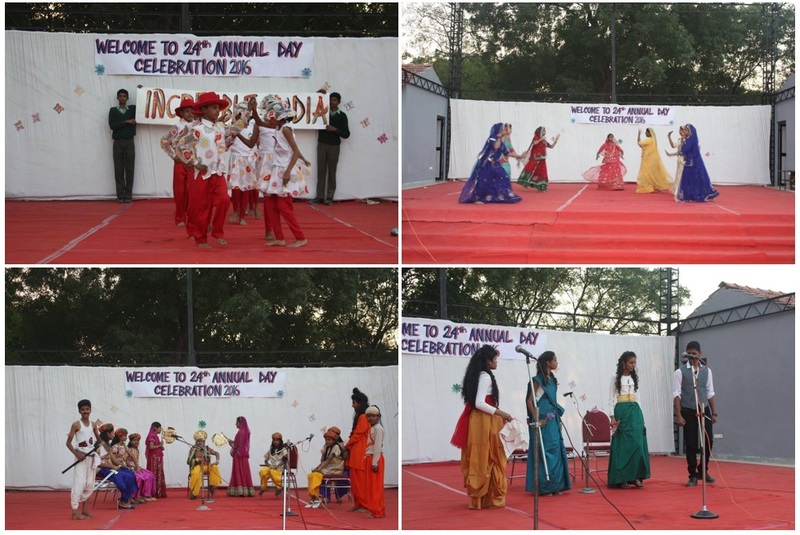 Friday, 18th November: School celebrated its 24th Annual Day. 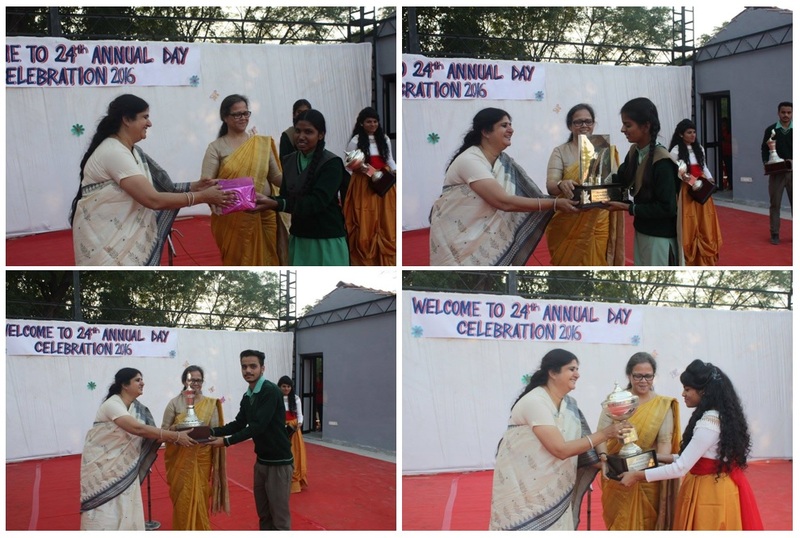 Chief Guest Mrs. Ritu Sharma escorted by Mrs. Bhavna and SMC Chairman Brigadier Karan Singh Chouhan arrived at 2:00 PM for High Tea hosted by School, followed by the inauguration of the Annual Day Exhibitions by Mrs. Ritu Sharma, Chief Guest. John L. Bissell Block housed Art and Craft, Sports and Social Science Exhibitions. Bimla Nanda Bissell Block housed Math Department and Science Exhibitions. Chief Guest Mrs. Ritu Sharma, Principal G.D.Goenka International School, Udaipur went around the exhibition at great length and asked questions in details related to their models, material used and information collected. She deeply admired the hard work of the students. Annual Day started with the Lighting of the lamp. The show started with the School Song. School Captain Blessy Maria welcomed the Chief Guest, followed by Principal’s Report, SMC Chairman’s Speech and Chief Guest’s Speech. 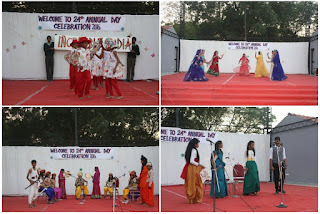 The Cultural Show included an English Play ‘Beauty and The Beast’, Hindi Play, Folk Dance and MGD School Presentation. The staff mesmerized everyone with their beautiful song ‘Kya Katal Hai’’. Mr. Byju Joseph gave Vote of Thanks. 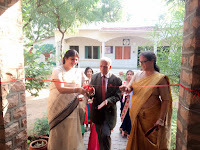 In her speech Mrs. Ritu Sharma elaborated upon The Fabindia’s mission to promote high quality education to both boys and girls and the groundbreaking ideas to spread the good work that the school is doing. She held School Exhibitions in high esteem, keeping in mind the detailed models made by students. A big thank you to Mrs. Ritu Sharma for the great effort in coming all the way to Bali and joining us for our Annual Day! Congratulations to all the winners! Well done girls you are three up!! Esteemed SMC Chairman Brigadier Karan Singh , Principal, distinguished guests, parents, teachers and dear students, I am honoured to be invited as the Chief Guest to The Fabindia’s 24th Annual Day Celebration. It gives me immense pleasure to join you all on this occasion. I have thoroughly enjoyed a brilliantly organized school exhibition and the wonderful performance put up on stage by the students to commemorate the occasion. I am indeed awestruck by you lush green campus and state of the art infrastructure, responsible for making learning a joyous process in such a beautiful environment. It’s always nice to be in the company of young people. It allows me to share the joy, energy and spirit of youth. I take this opportunity to celebrate your success in pursuing excellence in education and witness the remarkable achievements of this school. Fabindia has been consistently producing good results through its holistic approach to education. 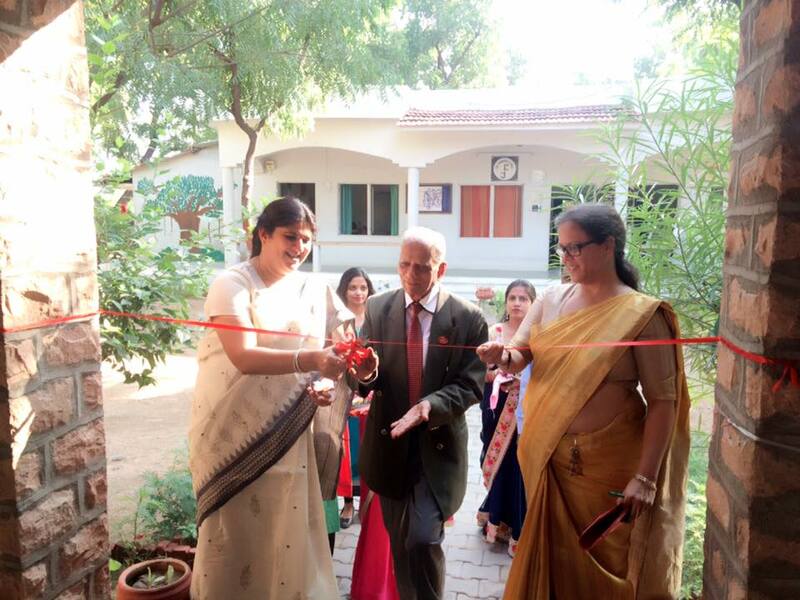 Under the excellent leadership of Ms. Deepika Tandon along with the whole hearted efforts of a dedicated team of teachers, a lot of innovative ideas have been successfully implemented in the school. It also has been offering much needed cross cultural exposure to its student’s body while remaining truly rooted in its own local heritage. I congratulate the Bhadrajun Artisans Trust and its associates for leading such a successful educational project in the country and setting a stellar example for us to emulate. Bearing in mind the ethos and culture of our land, Fabindia made it its missions to lay a solid foundation for each child and groom her for a lifelong journey of learning. William and John Bissell’s pioneering efforts to establish a model school for young people that could reach out to the rural populace of Rajasthan has made an incredible difference in the lives of many. The growing alumni body of Fabindia speaks volumes about impact it has had on the lives of numerous youngsters. Among children not attending school there are twice as many girls as boys, and among illiterate adults there are twice as many women as men. In a patriarchal society, Fabindia’s mission to promote high quality education to both boys and girls is truly ground breaking as we live in an environment which is negligent to the needs of girls children. Fabindia recognizes primary education to be the stepping stone in attaining social mobility, equality and employment opportunities. It is an apt to say that when you educate a woman, you educate an entire family. Offering basic education is one sure way of giving them greater power- of enabling them to make genuine choices over the kinds of lives they wish to lead. This is not a luxury but a basic human right. That woman might have the chance of a healthier and happier life. should be reason enough for promoting girls’ education. However, there are also important benefits for society as a whole. An educated woman has the skills, information and self-confidence that she needs to be better parent, worker and citizen. Hence, education is one of the most critical areas of empowerment for women. Empowering girls is through educating them and schooling is the primary step in that direction. I am glad to know that the school funds around 200 scholarships, majority of which are reserved for girl children alone. I am also pleased by the high percentage of girl children enrolled at Fabindia from neighbouring villages. It is needed a matter of pride that women hold several key posts in your school that aspires to achieve the dream of providing equal educational and job opportunities to men and women alike. Gathered here today are promising young minds that have reached a milestone in their lives and are looking forward to new challenges ahead. We also have parents amidst us who support their children with selfless love and educators who are passionate in moulding the students by equipping them to meet the demands of an ever changing world. As educators and parents, we share the responsibility of nurturing young minds by bringing out the best in them while inspiring them to become lifelong learners. Families and communities must be important partners with schools in developing curriculum and managing children’s education. The greatest gift we can give our daughters today is the power of education which can challenge the perpetuation of gender stereotypes. I ask the students of The Fabindia to not allow circumstances to dictate or restrict your dreams! Learning does not end when one leaves school. Look for the opportunities that hide behind adversities in life. Believe in yourself and remember that there is always another way of looking at the world. I wish you all the very best in your journey to fulfil your dreams, aspirations and surpass all our expectations. ‘’ Under the stars, I can see with my eyes that sweet dreams not only survive, but thrive. Saturday, 19th November: The School observed a holiday. Staff came to School to remove the Exhibitions and set the Classes for regular School on Monday.